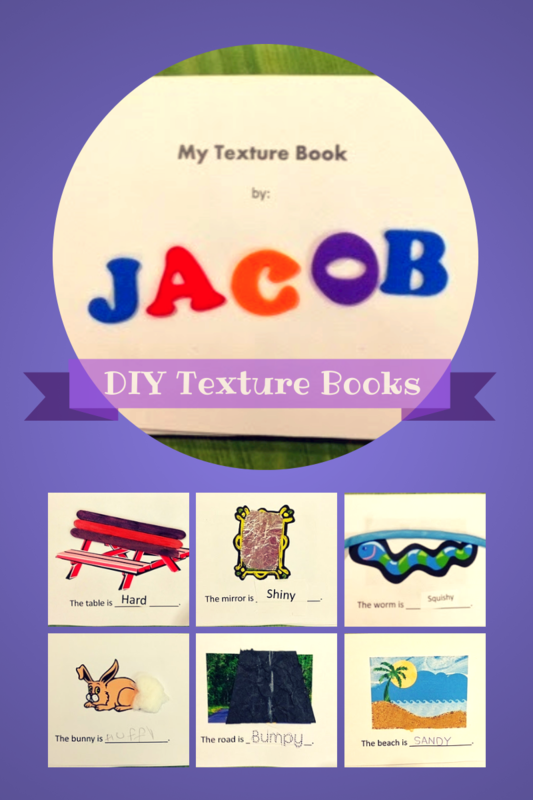 I love these DIY texture books for both a student activity and to store in our classroom library. These texture books work on both reading and writing skills, plus the additional sensory aspect may motivate students to read! This past month, we focused all of our art activities on texture. 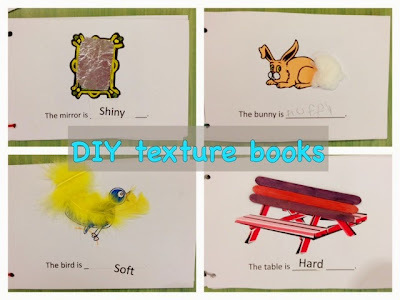 These activities included painting with texture paints (adding sand, glitter, baking powder, shaving cream, etc), filling balloons with different materials, and - my favorite - creating these texture books! 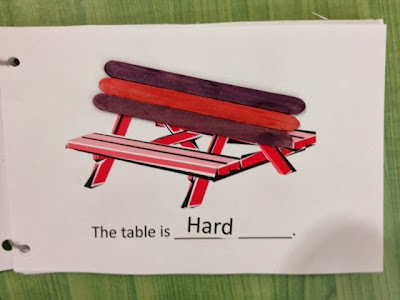 I created these books on PowerPoint and then set them to print as half pages using this tutorial from Kara at Sped-ventures (thanks Kara - printing like that has changed my life!) I also printed the pages on card stock so they would hold up a little better with the materials we would add to the book. For the cover page, I gave each student a handful of foam letters and they had to find the letters of their name. If they didn't have a letter in their pile, they needed to ask their classmates for help in finding that letter. This worked out great! 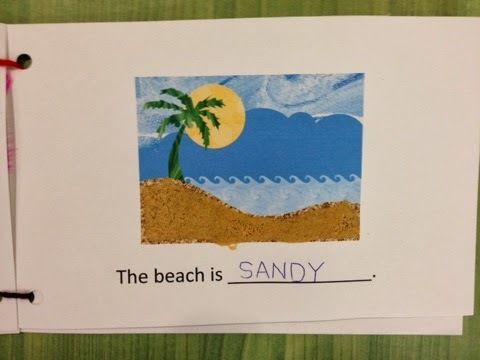 For the beach page, students covered the sand with glue and then chose between the light or dark sand to sprinkle on the paper. We did this over a container so we could re-use the extra sand that didn't stick to the glue. For the table, we added craft sticks (you could also use Popsicle sticks as well) to the top of the table. Some students added one to the bench as well. 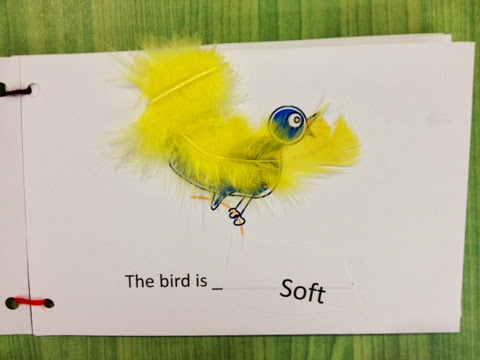 We added a soft feather to our birds. Each student picked their color and then we explored with the feathers a little before we glued them on our page. We "tickled" ourselves with the feather on our arms and our face. We watched it float to the ground, etc. This next one isn't exactly a "texture" - but I was pretty lenient with that term as I could only think of so many things! And we still did add "texture" to our book. 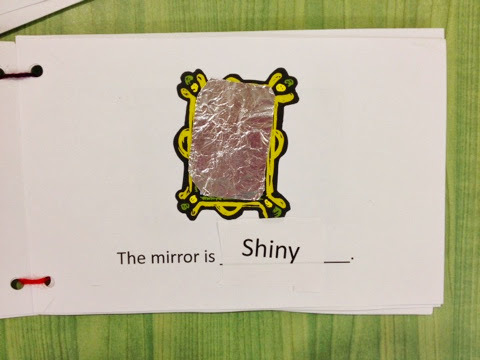 For the mirror is shiny, we glued on a rectangle of aluminum foil (also quickly talked about the dull and shiny side of foil). Since we have a gazillion bumpy and terrible roads after this winter, this next page seemed all too fitting. 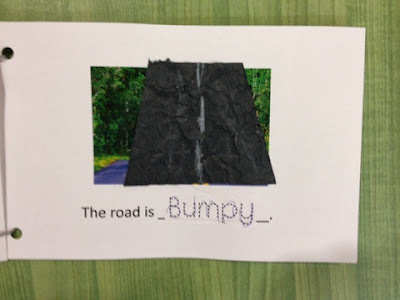 For "The road is bumpy." we added crinkled up black paper and then added the white lines down the middle. We all had a blast with our squishy worms! We used long skinny balloons, like you would use to make balloon animals (oh, the random things I find in my classroom) and filled them up with a quick squirt of shaving room. Really emphasizing the QUICK or you will have huge shaving cream bubbles in your worm and it will probably explode everywhere. We then stapled the part before the knot (if you staple after it the shaving cream will come out) to keep the worm on the page, and some students also glued the tail on the page, so it wouldn't fall out of the book. 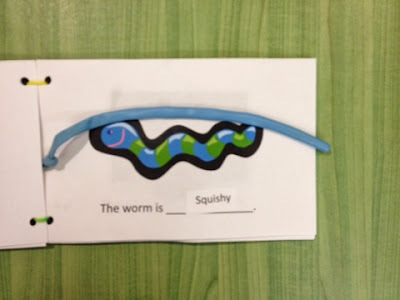 Another option to fill the worm was sand. 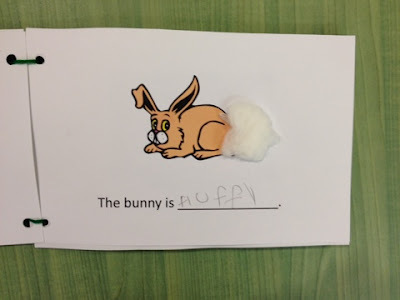 And the fluffy bunny, complete with a cotton ball tail. We then put two holes on the left side of each page using my 3-hole punch (these are half size pages, so two of them fit on here perfectly) and then students threaded their yarn through the pages and we tied them at the back with some slack so that the pages will turn easily. Students filled in the texture word for each student to the best of their ability, some students cut out the printed words and glued them, others cut out traced words and then traced them, and still others wrote the words in by themselves. Download the book here as a PowerPoint. I'd love to hear if you use this with your class. And I'd love to see picture of how yours turn out! 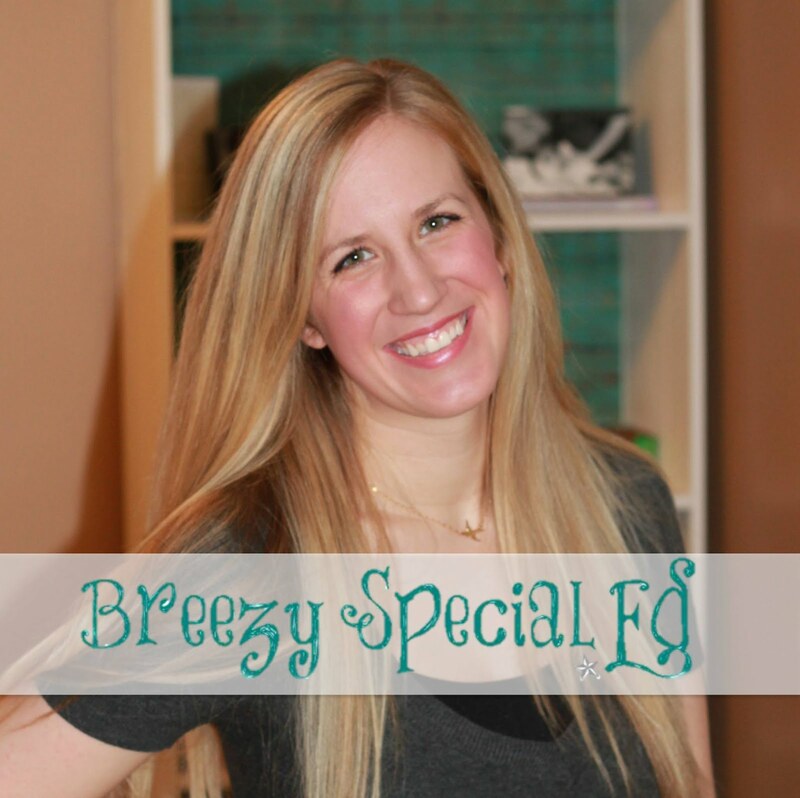 Feel free to share on my facebook page or tag me on Instagram @BreezySpecialEd! I'm sure there are a bunch of other pictures and textures you could use to add even more pages to this book. Do you have any other ideas? Please share in the comments so we can all benefit from your brilliance! So creative! I love your texture books! Love this! Can't wait to use it this year, especially since I have a deaf/blind kiddo who has objectives for exploring textures!! Thanks for sharing this!! 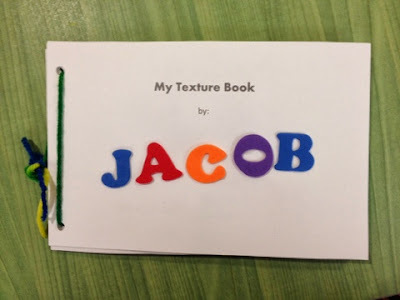 Thank you so much for sharing this texture book. I will be using it this week. Very nice idea! My students will definitely love to play and explore with this DIY texture books. That's why I keep reminding my students from academic essay writing service to include this on their activities.